While SUVs are the flavour of choice in recent years, the humble hatchback continues to be a popular option for first-car buyers, downsizers and those with just no need for anything bigger. Light cars are perfect for urban dwellers thanks to their compact packaging, and the competition remains red hot as manufacturers pump more and more kit into their tiniest offerings. 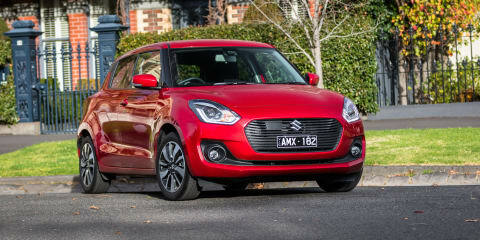 Two well-known nameplates in the segment are the Suzuki Swift and Kia Rio, and in this comparison we have the top-spec versions of each car, both starting a smidgen under $23,000 before the obligatory on-road costs. In the red corner we have the Suzuki Swift GLX Turbo with its three-cylinder turbo petrol engine at $22,990, and over in the grey corner we have the Kia Rio SLi – powered by a naturally aspirated 1.4-litre petrol – also starting at $22,990. Both cars come with automatic transmissions as standard – the Suzuki has six cogs while the Kia makes do with just four, but we’ll get to that later. With both hatchbacks priced the same, it’s interesting to see what each company offers coin for coin. 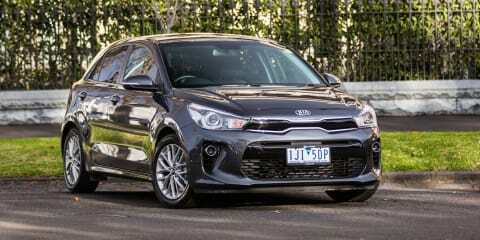 Kia is known for offering good value for money, and the Rio is pretty well specified. Standard kit in the SLi includes 16-inch alloy wheels, climate control air-conditioning with auto defog, alloy sports pedals, an electric tilt/slide moonroof, privacy glass, automatic headlights and wipers, halogen projector headlights with LED daytime-running lights, LED tail-lights, leather-look seats, steering wheel and gear shift, an electrochromatic rear-view mirror, along with heated electric folding exterior mirrors. Other features include a 7.0-inch touchscreen infotainment system with satellite navigation and live traffic updates, Apple CarPlay and Android Auto compatibility, rear-view camera with dynamic guidelines, rear parking sensors, keyless entry, AUX and USB inputs – including a USB port at the rear – cruise control, Bluetooth phone and audio streaming, along with a six-speaker audio system. The Suzuki misses out on the leather seat trim, automatic wipers, live traffic updates and heated side mirrors, but counters with brighter full-LED headlights, push-button start, autonomous emergency braking (AEB), adaptive cruise control and lane-keep assistance – safety tech you cannot even option on the Kia. However, neither vehicle offers blind-spot monitoring or rear cross-traffic alert, both of which would really help in car parks and driveways – places where these cars will spend a lot of their time. Another point of difference is what powers these cars. The Kia gets an old-school 74kW/133Nm 1.4-litre naturally aspirated four with a four-speed auto compared to the Suzuki’s 82kW/160Nm 1.0-litre turbo triple and six-speed self-shifter. We’ll get to the nitty-gritty of the performance differences later, but the Suzuki’s unit definitely offers more bang for your buck. The Kia makes up for things in the cabin, with a clean and uncluttered design that also feels more refined than the Suzuki. Drivers are treated to a leather steering wheel that looks and feels premium, simple yet clear instrumentation including a digital speedo, along with an upmarket-looking tablet-style 7.0-inch touchscreen that features native navigation, Apple CarPlay and Android Auto, along with DAB+ digital radio. Seating up front is good too, with adequate support and bolstering without being too figure-hugging. There’s also a nice big storage cubby under the centre stack, along with decent door bins with bottle holders. The Kia’s infotainment system is probably the best in the class, largely thanks to the fact it’s really simple to use, quick to respond to inputs, while also looking and feeling it belongs in a more expensive vehicle. In terms of materials quality, all of the plastic finishes across the dash and doors are of the hard, scratchy variety, though everything feels solid, and your elbows are catered for by squishy armrest inserts in the doors along with a leatherette-trimmed centre bin lid. It’s very black-on-black-on-black, which could be a little soulless for some, but the contrasting gloss-black trims around the gear shift and air vent surrounds present better than the materials used on the Swift. However, our tester did develop a very irritating squeak from the driver’s instrument cluster, which seemed to get worse over successive road imperfections. In the back, the Rio continues to impress with decent head and leg room, even for taller passengers, while also offering an additional USB outlet so one person in the back can charge their mobile device. Two adults will be comfortable in the rear, and there’s enough space to squeeze three abreast for shorter journeys. Parents will be happy to hear that there are two ISOFIX child seat mounts on the outward seats. There’s one map pocket on the passenger side, and the rear doors also feature bottle holders. Behind the second row is a 325-litre boot, which expands to 980L with the rear seats folded. While not class-leading, it’s one of the largest in class, and is significantly more accommodating than the Suzuki’s 242L luggage area. Under the boot floor is a temporary space-saver spare wheel. Meanwhile, the Suzuki is a little more basic in its design and execution, making do with cloth trim on the seats, no centre armrest, and cheaper-feeling plastics throughout the cabin. The big, chunky steering wheel feels nice in the hand, but cannot match the Kia’s for upmarket feel, and the driver’s cluster lacks a digital speed readout like the Rio. Pitched as a sportier offering, the Swift gets red backlighting for the driver’s instrument cluster, with silver highlights that add a touch of flair the Kia lacks. Sitting in the centre of the dash is a 7.0-inch touchscreen that features navigation, Apple CarPlay and Android Auto, which (mostly) matches the Kia for features, though it’s not as quick to respond to inputs and the interface doesn’t look as classy. It also lacks live traffic updates and DAB+ digital radio included with the Kia’s system. There are no physical buttons around the display either, and at times the touch-sensitive capacitive shortcuts can be awkward to use while driving. Storage up front is less accommodating than the Kia, with a smaller space under the centre stack and no centre storage cubby. In the back, the Swift offers pretty good room despite its size – it’s 200mm shorter in length than the Rio and has a 130mm shorter wheelbase – though it does feel tighter than the Kia. There are no USB ports in the back, but there are bottle holders in the rear doors along with a single map pocket behind the front passenger’s seat, along with two ISOFIX mounts on the outer pews. Behind the second row is a piddly 242L luggage area, which is just about worst in the class – even less than the Mazda 2 (250L). It does expand to 918L with the back seats folded, though there’s a larger hump where the boot floor meets the rear seatbacks compared to the Kia. The slightly cheaper Suzuki Baleno GLX Turbo ($21,990) forgoes the active safety systems offered in the Swift, though offers superior cabin space and a much larger 355L luggage capacity with the same 1.0-litre turbo engine. Overall, the Kia offers superior practicality and ambience compared to its Japanese rival. Possibly the biggest differentiator between these two vehicles is how they drive, largely due to the engine and transmission combination offered by each. The Kia Rio, at least for the time being, is only available with a naturally aspirated ‘MPI’ 1.4-litre petrol engine, which pumps out 74kW of power at 6000rpm and 133Nm of torque at 4000rpm. Drive is sent to the front wheels via an equally old-school four-speed automatic transmission. Meanwhile, the Swift offers a superior 82kW at 5500rpm and 160Nm from just 1500rpm from its turbocharged 1.0-litre ‘Boosterjet’ three-pot mated to a six-speed automatic driving the front wheels. The Rio is also some 200 kilograms heavier than the Suzuki, contributing to a significant deficit in power-to-weight ratio – 63.7kW/tonne for the Kia compared to 88.6kW/tonne for the Suzuki. Whereas the Swift feels brisk and enthusiastic from a standstill, while also sending that characterful thrummy three-cylinder engine note into the cabin, the Rio feels asthmatic, lethargic and heavy. The Kia’s lack of low-down urge and the cumbersome four-speed auto lag behind the Suzuki’s drivetrain in just about every aspect, and feels really dated by comparison. A six-speed manual is available in base S-trim for the same engine, though unfortunately the top-spec model is auto only. However, once at speed, the Rio claws back some ground, if only a little, thanks to its well-sorted locally tuned ride, superior body control, and marginally better road-noise suppression than its Japanese rival. It also feels more mature than the Swift – more planted at higher speeds and a more predictable steering feel that is both light and direct. The SLi’s 16-inch wheels aren’t as forgiving over sharper bumps than the 15s used on the mid-spec Si, though, and road noise is still pretty noticeable over rougher surfaces. Meanwhile, the Swift feels noticeably peppier and more nimble than the Korean, thanks to its more powerful engine, smarter transmission and sharper turn-in. The steering feels quite heavy compared to the Rio, though it offers a little more feel and contributes to the Swift’s more sporting nature. Having the wheel-mounted paddle shifters is a nice touch for the racing drivers at heart, though the manual mode will shift for you if you get too close to the red line. However, the experience is dulled somewhat by the tyre roar, which is pretty noticeable at just about any speed or road surface. While the ride is almost as good as the Rio’s, the Swift can float a little after large drop-offs, taking a split-second more to recover than the Kia. There was also quite a difference in fuel consumption between the two cars. While neither features idle stop/start technology, the Rio’s trip computer indicated usage of 7.7L/100km over our mixed-conditions test loop, while the Swift was far more frugal at 6.3L/100km. Both, however, were quite a bit higher than their respective claims – Suzuki claims 5.1L/100km combined for the turbo Swift while Kia claims 6.2L/100km combined for the Rio. The Suzuki’s 37-litre tank may be short on the Kia’s 45L capacity, though you’ll still spend less time at the pump. It’s worth noting, though, that the turbocharged Swift has a taste for minimum 95 RON unleaded, while the Rio is happy with regular 91 RON. It really is a shame that the Rio isn’t offered with the 1.0-litre turbocharged three-cylinder engine Kia offers in overseas markets like Europe – which comes in both 73kW/172Nm and 88kW/172Nm tunes – as it would address the key issue of the new Rio, which is the drivetrain. However, that powerplant is manual only, which would make it a no-go for many Australian buyers. Kia is the industry leader when it comes to cost of ownership, and the Rio is no exception. It’s covered by the company’s seven-year/unlimited-kilometre warranty with up to seven years of capped-price servicing and roadside assistance. The Swift, on the other hand, is backed by a three-year/100,000km program with five years of capped-price servicing. Scheduled maintenance is required every 12 months/15,000km for the Kia, while the Suzuki needs to be serviced every six months/10,000km. In terms of costs, the Rio will set you back between $226 and $561 for the first seven years, totalling $2441 for the life of its seven-year plan. Meanwhile, the Swift demands between $175 and $429, costing a dearer $2452 for only the first five years. Suzuki’s reputation for reliability, however, is up there with the best of them. Despite that, the Rio offers a superior warranty and servicing program that trumps that of the Swift. Not a whole lot separates these two on paper, nor price, and the test was actually pretty even until it came to the driving component – which is obviously important considering that’s what you spend the most time doing with your car. The Kia Rio may have superior interior packaging and a far better warranty and service program, but it just cannot match the Suzuki’s driveability or active safety suite. Considering both of these vehicles are priced at the pointy end of the market too – keep in mind you can have an automatic Volkswagen Polo 81TSI Comfortline from $21,190 or a Mazda 2 Genki from $22,690 – it’s bizarre that the Kia is a brand-new model and has no form of driver-assistance technology and an out-of-date drivetrain. It’s a real shame, because the Suzuki’s budget-feeling interior, tiny boot and expensive servicing costs relative to the Kia would have handed the win to the Korean if it had a better powertrain and transmission combination. We do have to, however, commend Suzuki for not only keeping up with the class leaders by including autonomous emergency braking and lane-keep assist in a light car, but also leading the pack by adding adaptive cruise control to a vehicle that is accessible to the masses. The Swift’s 1.0-litre Boosterjet turbo is also a highlight, providing great performance and a charming engine note that really sets it apart from the Kia and numerous other naturally aspirated rivals. While the Suzuki wins this test, neither vehicle is at the top of the light-car class, and we’d definitely recommend also having a look at the Mazda 2, Honda Jazz and Volkswagen Polo for similar, if not less, money.